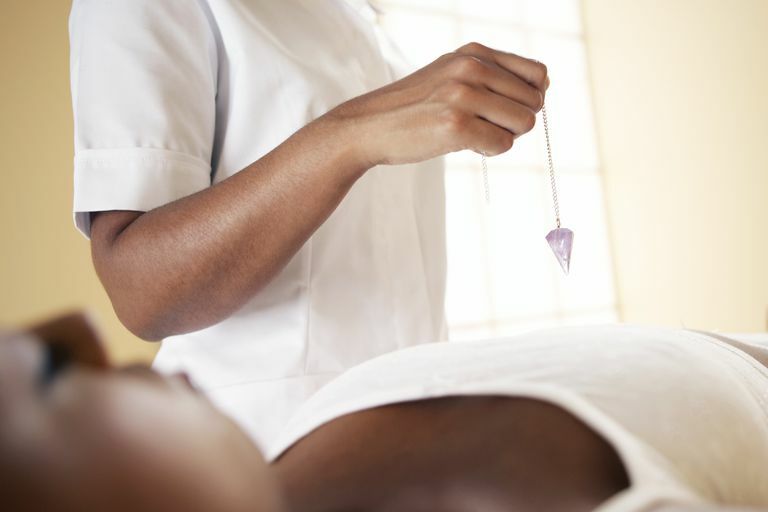 Reiki practitioners will often create a relaxing atmosphere for their Reiki sessions, setting the mood with the use of dimmed lights, meditative music, or bubbling water fountains. Here are some select tools, healing room furnishings, attire, and other specialty items specifically meant for Reiki healers. These Reiki Stones are not a typical tool used by Reiki practitioners. However, this set, pictured above, is a good option for those who do. Reiki symbols are used to increase energy and to help direct the flow of chi. The four Reiki symbols depicted on these stones are the Master Symbol, Power Symbol, Harmony Symbol, and the Connection Symbol. They're great for conducting absentia Reiki to help promote focus and seal the practitioner's intent. Each card has a purpose along with a healing technique that you can apply to achieve that purpose. For example, the Listening Card offers a technique to help you communicate with your higher self. The Freshen Up Card offers a combination exercise/breath/sound technique that purifies the body and revives your energy at the end of an exhaustive day. Not so much a tool, but more of a healing talisman for the practitioner to wear invoking ki energies. The power symbol, Cho Ku Rei, is used in Reiki as a light switch to turn on Reiki energies. A massage table is the most convenient tool for conducting Reiki treatments at home or healing practice. This table can be special ordered with extra width and extra padding for client comfort. However, these modifications make the considerably heavier for portable use. If you are planning on transporting your table frequently, then their standard table would be the better option. Choose from a wide selection of Reiki CDs to play during your next Reiki session. Soothing music is a relaxing complement to energy healing treatments. You won't go wrong if you go with Reiki Gold CD, winner in About.com 2011 Readers' Choice Awards. The Reiki News Magazine is a 72-page full-color glossy magazine containing articles on every aspect of Reiki practice. Quarterly publication. Get a Reiki poster that demonstrates the twelve basic hand positions for conducting a Reiki treatment. The Reiki practitioner can program this special timer to chime at preset intervals. There are eight possible settings every 2, 2 ½, 3, 4, 5, 10, 15 or 20 minutes for up to 90 minutes. Chimes can serve as a reminder to switch Reiki hand-placements during a healing session. The timer's quiet sounding signal be used by any type of therapist or healer to help regulate their sessions without having to watchful of a clock. I've had several practitioners write and tell me that they use my book The Everything Guide to Reiki as a student textbook for their classes. I'm am truly honored to hear this since it is intended to help beginners learn about Reiki. It is also meant to help all Reiki practitioners to deepen their passion for Reik, and choose it as a way of life. A water fountain will make any space a more calming atmosphere. Water fountains aren't just for the meditation room. They are perfect for the bedroom, home office, the rec room, and even the kitchen!. Choose from a variety of fountain designs. Reiki principles are imprinted on this t-shirt as a reminder to follow the Reiki Creed taught to all Reiki initiates. Clothing adorned with Reiki words or symbolism is a favorite "work uniform" for the Reiki practitioner when conducting sessions. Wearing Reiki garb out in the community serves as a way to open up conversations with people who want to learn more about what Reiki is all about.